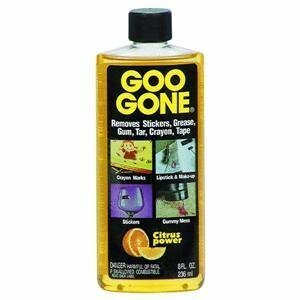 A plastic bottle of liquid adhesive that removes grease, gum, stickers, crayon and tape. Contains 8 fluid ounces. Has a citrus power smell. Danger: Combustible. Harmful or fatal if swallowed. Keep out of reach of children.